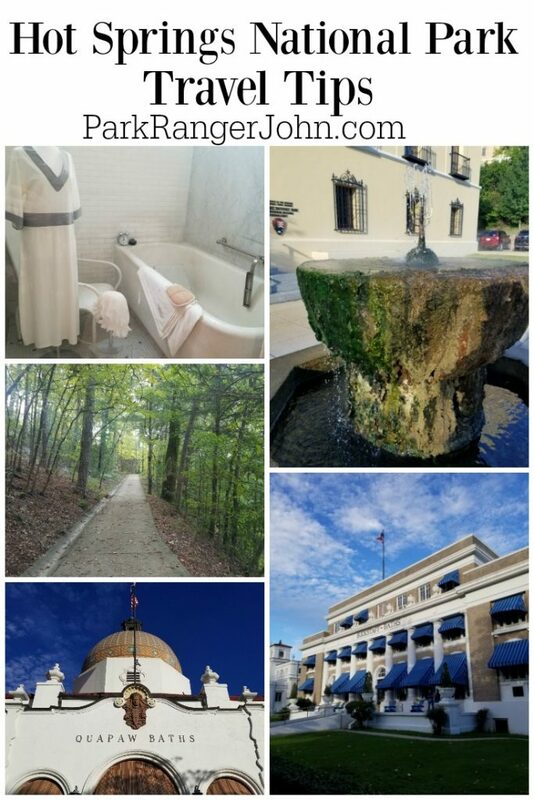 Are you planning a trip to Hot Springs National Park? We hope that these Hot Springs National Park Travel Tips help you plan a great trip! We hear from a lot of people that they don’t understand why Hot Springs is a National Park. The park was created in 1832 as the Hot Springs Reservation to help protect the “healing springs”. The healing springs have been used for hundreds of years. In 1804 President Thomas Jefferson sent a scientific team to investigate the hot springs on the Washita that were already well known. When you visit the park remember that the park was created to protect the water. It feels really odd visiting a park that is in the middle of a city I know. Hot Springs National Park protects over 5,500 acres of lands to keep the “healing waters” available for all visitors. Be prepared that the National Park is in the middle of Hot Springs, Arkansas. This park is very different than most National Parks. There is free parking at a city garage on Central Ave. The water coming out of the fountains is HOT! Be careful if you have kids with you that they don’t blindly reach for it. Parts of Hot Springs, Arkansas are honestly a bit rough and seedy. If you are traveling with kids it may not be a bad idea for them to have some tech to distract them as you drive into the park. Some of the neighborhoods have multiple cabaret bars and are just rough. Make sure you know the health risks before taking a bath at a bathhouse. We heard that it is not uncommon for ambulances to be outside the bathhouses. The hot water can affect people with heart conditions and other health risks. Bring a jug or 5 with you to fill up with mineral water. We saw people filling up giant water jugs and packing them into their cars. There are 2 cancellations stamps, one at the visitor center and one in the gift shop down the street. Watch your valuables and be aware of your surroundings. I don’t want to scare you from visiting Hot Springs National Park but please be aware of your surroundings. The park is in the middle of town and there were individuals that we felt were scoping out easy prey for stealing things. Make sure and watch the park movie at the visitor center! It does a great job of explaining the history and importance of the park. How much does it cost to visit Hot Springs National Park? There is no fee to visit Hot Springs National Park. There is a fee if you chose to visit the Quapaw or Buckstaff Bathhouse and experience a mineral bath. How do I get to Hot Springs National Park? Hot Springs National Park is located in West-central Arkansas approximately 45 miles from Little Rock, Arkansas. Where is the Hot Springs National Park Visitor Centers? The Hot Springs NP Visitor Center is based in the Fordyce Bathhouse located on bathhouse row. Where can I find out about staying/camping in Hot Springs National Park? Hot Springs National Park has one campground the Gulpha Gorge Campground. Visit our Hot Springs Camping Guide to learn more about staying in this campground. Is there a Junior Ranger Program at Hot Springs National Park? Yes, There is a junior ranger program at Hot Springs National Park. Junior Ranger programs can be picked up at the visitor center and also at the main gift store on Bathhouse Row. Can I bring my Dog/Pet with me to Hot Springs National Park? Hot Springs NP is a pet friendly park. Pets are welcome on the hiking trails and in the campground. Pets must be on leashes. Pets are not allowed in the visitor center or other park buildings. There are Pet Waste Station located on both ends of Bathhouse Row and in the campground.